Smaller markets feel the pinch when a supercenter opens. Many tout their customer service, community involvement and the loyalty of longtime residents as their means to survival. Walmart offers a large selection of produce. Greg Hertz of Moody Markets talks with employees of Super One Foods in Polson. The store stocks local produce and products. Polson’s Walmart Supercenter opened its doors October 24, 2013, on 28 acres that were re-zoned to commercial property and annexed into the city the city of Polson. Polson’s Walmart Supercenter is now three times the size of the original Walmart, which opened in 1988 in the building now occupied by Murdoch’s. While the lawsuit didn’t prevent the Supercenter from eventually opening, it did delay progress for many years. Greg Hertz, President of Moody’s Market Inc., and a member of Lake County First, commissioned the Retail Research Group in 2006 to study the possible effects of a Walmart Supercenter on local grocery stores. The survey anticipated that Super One Foods and Safeway — two 45,000 square foot grocery stores have served Polson for many years — could lose 33 to 36 percent of sales. Pablo Family Foods could lose 26 percent of sales and Mission Mart and Harvest Foods in Ronan stood to lose 15-17 percent, according to the study. “People in the community need to realize that the population base in Lake County is not large enough to support Super Walmart and two major grocery stores,” Hertz said. Hertz foresees an eventual change in the market. He indicated that both Miles City and Havre only have one major grocer and one Walmart Supercenter, and something similar could take effect in Polson. “Since (the Walmart Supercenter) has opened, it has impacted our business, which resulted in the cut of about 11 full-time employees (from Super 1 and Harvest Foods in Ronan). We recovered approximately half of our sales (that) we lost in November,” Hertz said. Even with a reduction in sales and staff, the locally-owned stored continues to be “a strong member of the community” and supports the community “through donations to various non-profits and events in the area,” Hertz said. 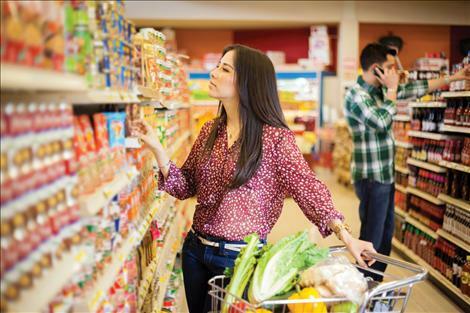 Moody Market’s Super One Foods store offers some advantages. It’s located within walking distance for many Polson residents, and is known for its many gluten-free food options. Hertz also said that Moody’s Markets provides an outlet for locally produced items, an advantage they offer as a way of serving the community for more than 30 years. 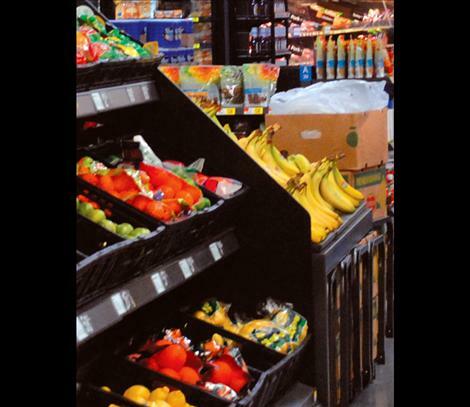 While Walmart may not offer as much local fare, Walmart’s competitive edge is providing a sizeable produce section in the 155,000 square foot store, according to Store Manager Dan DeWitt. “I’ve been in the grocery business for 25 years, and I know what comes with the years. Produce is kind of a staple. We might get some odds and ends stuff with different products coming in but its pretty basic,” DeWitt said. He said that the town has been very accepting, and that the store will get more diverse in ordering and implement product as necessary for the community. Before DeWitt was manager, he said he worked for an independent store that just didn’t have the dollars to put back into the community like Super Walmart can here. He said that Walmart Supercenter gives out $10-$15,000 in grants every year, and that they work with 4-H Club and Boys and Girls Clubs within the community. Walmart has competition with everybody including Target, Cabella’s and various grocery stores in surrounding cities, according to DeWitt. He says that the store competes against Missoula and Kalispell just to see how things are merchandised and how they can implement what the other stores are doing right into their store. He said he didn’t know personally how the new store has affected Polson, but that competition is good, and has been a factor in the way he merchandises the store’s products and business as a whole. “Anybody can pick you apart, but if you look for the reason why a store is doing what they are doing, then you can do something right,” DeWitt said. Safeway management did not want to comment on local production values, as this would allude to how much the store generates on a weekly basis, and in general, due to their corporate policy. George and Ramona Mahoney, owners and operators of Polson Bay Grocery, both agreed that their store didn’t feel any impact from the new Walmart Supercenter. “I think it was inevitable, I mean you just can’t stop progress, if that’s what you want to call it,” George Mahoney said. Mahoney talked about the loyalty of his customers, and how their location has served their business in terms of service and convenience over the last 34 years in Polson, and that it really is all about customer service, especially in such a tight-knit community. Super Walmart employs roughly 200 people, according to DeWitt, which is approximately eight percent more than they had originally anticipated. While that’s good for the unemployment rate, Polson Bay Grocery now has a tougher time hiring workers. “The most impact we’ve seen is that it’s difficult to find employees. That’s probably the most critical thing.” he said. On the positive side, Mahoney said that Super Walmart brings people to Polson who may likely have gone to larger cities to buy certain products. “Walmart is pulling people in from Ronan, Pablo, Rollins, and up the east shore, and there was a need. We needed things and we couldn’t get them here. Sometimes we had to go to Missoula or Kalispell and now we are able to buy them locally,” Mahoney said. Pablo Family Foods Manager Tim Schauss said both their sales and amount of customers have been impacted with the arrival of the Walmart Supercenter, because much of their business is generated by people who travel through Pablo along Highway 93. “We had a person retire and just didn’t end up replacing them,” Schauss said. Turner said from the standpoint of a local businessperson and community member, he and his wife continue to shop as they always have. Safeway recently joined the Chamber and is stepping up as far as community involvement goes, according to Turner. In other towns where a Walmart Supercenter has opened, the success of a business largely depended on the ability to make adjustments and adapt; ultimately it’s up to the residents to choose whom they will support — the local stores, the mega store, or both.